A proposal for forest clearance to the Ken-Betwa river-interlinking project, which involves diverting 6,000 hectares of the Panna Tiger Reserve in Madhya Pradesh, has been put up to the environment ministry's statutory appraisal panel. About 80 per cent of forests required for the project fall in the tiger reserve on either side of the Ken. The Centre plans to work around this as the project is appraised for forest clearance. The environment ministry had commissioned the Wildlife Institute of India, a government research body, to assess the impact. The institute's report, sources said, would suggest allowing part of the tiger reserve to be diverted. The government is likely to propose alternative additional land for the 54,266-hectare reserve, now home to 24 tigers that had become locally extinct in 2009. The Rs 9,393-crore project involves 9,000 hectares, half of which is forest. If the project is cleared, 10 per cent of the tiger reserve will be taken away. The Ken-Betwa project involves transferring 591 million cubic metres of surplus water in the Ken basin through a 231.45-km canal to the Betwa river. Land needed for acquisition is an estimated 6,000 hectares and the cost of resettlement Rs 333 crore. Around 1,600 households will be displaced. 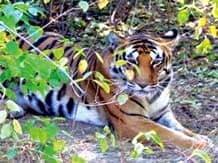 In its resettlement & rehabilitation plan, the government has claimed 779 households living within the tiger reserve would be rehabilitated under a voluntary relocation plan meant for villagers who choose to leave the reserve for conservation of tigers and get Rs 10 lakh as relief. It is not for people displaced by infrastructure projects who are covered under a 2013 land acquisition law that requires consent of a majority of villagers and has a larger compensation package. The project will also need a clearance from the National Board for Wildlife. Recently, the government changed the composition of the board and cleared most of the 140 projects it reviewed. The project will also need to get consent from villagers with rights over forest lands under the Forest Rights Act. "The impact of the Ken-Betwa project on Panna, and tigers can only be disastrous. The Ken river is home to the critically endangered, and endemic, gharial. It is also one of the few perennial rivers of Madhya Pradesh," said Prerna Bindra, former standing committee member of the National Board for Wildlife. In 2011 Jairam Ramesh, the then environment minister, had termed the project a "disastrous" idea. However, after the National Democratic Alliance came to power, Union Water Resources Minister Uma Bharti said the Centre would link the Ken and Betwa rivers on priority. The Union Cabinet approved the project in principle in July.